JCMU has been providing high quality academic language programs and a wide variety of culture programs for university students from Michigan and other States since the center was established in 1989. More than 2,500 students have studied “Japan” here in Hikone for 25 years. Academic Program, May Short Program and Summer Intensive Course conducted successfully every year help students to deepen their understandings of Japanese language and culture. Some of them are now working for Japanese companies and governmental organizations in the U.S., and some are teaching English in Japanese public schools in the JET Program after graduating from their home university. We are proud that the center created many important bridges between Michigan and Shiga. Please click here to be directed to the JCMU administrative office at Michigan State University, for further information regarding the JCMU enrollment process. 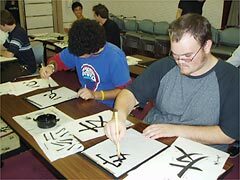 Academic program which has two semesters every year starting in September and January presents intensive Japanese language instruction and courses in Japanese culture, society and history. Students may also pursue studies in specific Japan-related topics at partner universities in Hikone. Some of the topics are environment studies, economic study and Japanese pop culture. JCMU also accepts a visiting scholar from the U.S. each semester. This scholar lectures on his or her Japan-related specialized fields in an afternoon session. May Short Program is designed for the learners to deepen specific topics on Japanese culture/society. Only ten days course held on May is not included Japanese language education. This nine-week course starts in June, and offers different level of intensive language classes. In order to boost students’ language potential only, this course focuses only on language, as opposed to including other culture classes, for the purpose of developing strong skills in this area. Flower arrangement, Tea ceremony, Calligraphy, Koto, Aikido and so on. The students on the academic program are given to make a speech in Japanese at the end of semester. As a good opportunity to demonstrate their language achievement, it is very interesting that students choose nice topics to be based on students’ experiences and studies in Japan. “Seeing is Believing.” JCMU conducts several field trips to historical/educational places, such as Nara or Kyoto, to reinforce students’ study in the classroom. Students can easily gain an understanding of Japanese culture and history through on-site learning. The Hikone Board of Education invites JCMU students to the elementary schools in Hikone. Each elementary school provides their students with interesting education opportunities to know about the U.S.A. with JCMU students. JCMU students play important roles in developing global mindsets for the Japanese elementary school students through the school visit. As a series of productive experiences in Japan, JCMU provides many chances to work for Japanese companies in the Internship Program. JCMU students can choose from a variety of fields and companies in Shiga; car dealers, environment-related companies, municipal offices and so on. Through these internships, JCMU students take in information about Japanese businesses experience. The companies may learn different business perspectives from the overseas students. JCMU developed student exchange agreements with Shiga University and The University of Shiga Prefecture. Under these agreements JCMU students can participate in coursework at each university in exchange for those students studying at the home campuses of JCMU consortium universities in Michigan. JCMU students can take several specific classes at those universities.